Moving into the Fault Line Park adjacent building that last housed dual concepts Stella Public House and Halcyon in San Diego's East Village is a new brewpub and restaurant from locally grown craft brewery Amplified Ale Works. First launched by owner Alex Pierson as California Kebab in San Diego's College Heights area in 2009, the company eventually relocated to it's beachside mezzanine space in Pacific Beach in 2012 before transitioning into Amplified Ale Works. In order to increase craft beer production, the crew opened a tasting room and brewing facility outpost at HG Fenton's original Brewery Igniter facility in Miramar in 2016. 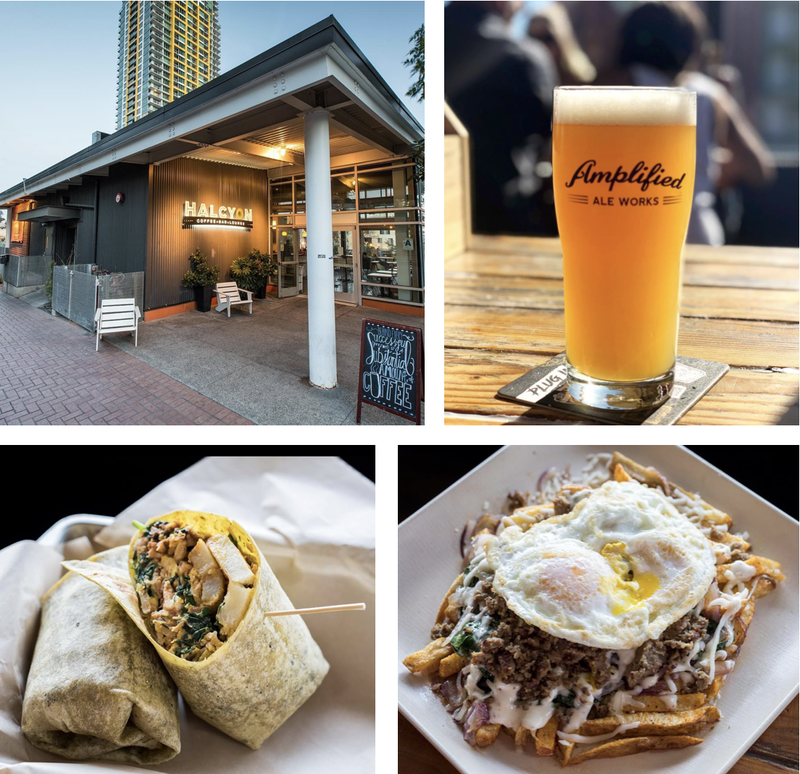 Just this past April, Amplified expanded once again, taking over the ground floor space below its Pacific Beach location to open the Backstage Beer Lounge, a rock-themed tasting room and private event space. "We couldn’t be more excited to open this brewpub," said Amplified owner Alex Pierson. "We have spent years looking for a space that shares similar qualities to our original PB brewpub. With an open floor plan, basement space for brewing, a full kitchen, and a large outdoor patio, this location checks all of the boxes. Though the immediate area has seen its challenges over the years, we are committed to being a positive catalyst for the neighborhood and helping to fulfill the original vision of Fault Line Park being a community gathering space." This Summer, Amplified Ale Works will expand once again, taking over the nearly 5,000 square-foot indoor-outdoor building at the corner of 14th and Island in the East Village. The team is currently turning the 3,000 square-foot interior into a coffee house, cocktail bar and Mediterranean-style eatery, with the 1,500 square foot patio becoming a picnic table-lined, dog-friendly beer garden. The new Amplified branch will have a full liquor license, which means the addition of craft cocktails and will also have a caberet license, allowing them to host frequent live entertainment. Once opened as early as this July, the East Village brewpub will operate from 7am-2am, offering coffee service in the morning (using the company's new Amplified Coffee) with an eventual breakfast and brunch menu to be added, and lunch and dinner options that include doner kebab wraps and bowls, skewers, veggie burgers, falafel, salads, and the eatery's delicious doner fries. Although there will not be brewing operation onsite to start, the team hopes to add a mini-brewing facility at some point. "We have toyed around with the idea of a coffee brand for Amplified, given our DIY ethos and the natural fit with our name," said Pierson. "But with lease stipulations requiring the operator to be open in the morning, we decided now is the time to give it a go." Amplified Ale Work will be located at 1492 Island Avenue in San Diego's East Village. For more information, visit amplifiedales.com.